Add 5% (GST) tax to the above posted rates. All prices are in $CAN. Please note: a temporary 5% fuel surcharge applies to all fishing charters while local regular gasoline prices remain over $1.20/liter. We are no longer able to absorb these high fuel costs and apologize for any inconvenience. *Further discounts may apply to multiple, day, multiple boat or last minute trips. Please contact us for details. 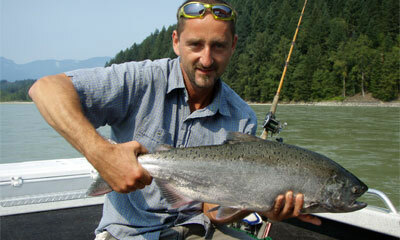 *Remote wilderness river fishing packages are custom quoted. Accommodation / Transportation / Fishing packages quoted upon request. Payment: For your convenience, we accept Visa, Master Card, Discover, or American Express via PayPal. To process a deposit or deposit/final payment for your trip via PayPal, please use the PayPal Pay Now button. It'll take only a couple of minutes, and NO ACCOUNT SETUP is required. If you'd prefer for us to process a deposit and/or final payment for your trip, we'll gladly accept Visa or Master Card. We also accept cash or interac e-transfer for deposit and/or final payment. Prices are in Canadian funds and do not include GST (5%), fishing licenses or gratuities. A 50% deposit is required at the time of booking. Payment can be made by Visa, MasterCard, Amex, money order, or cash. In such case of a cancellation, your deposit is fully refundable up to 14 days prior to the date of your trip. With a cancellation notice of 7 to 14 days, only 50% of your deposit will be refunded. Your deposit is non-refundable within 7 days of your booking, however, all deposits can be applied to an alternate date within the same calendar year. We will wait for up to 2 hours past your start time to arrive. Should your group not arrive within this grace period, we reserve to right to call it a day. Please note, a full payment will be due.